You are in love with the industrial style and want to bring it into your home? We want to help you and show you what kind of floor lamps you can choose to get the special industrial flair. Keep on reading to find out everything you ever wanted to know about industrial style floor lamps. Industrial interior design describes a style that is known for its edgy an rough look. It should remember to the time of the industrial age and is often associated with spacious lofts and walls of bricks. But of course you don’t need to have a loft to get the industrial feeling. There are a lot of furniture and accessories you can choose and add to your home interior decor to create this special look. A great way is to choose an outstanding floor lamp with an industrial style. Floor lamps with an industrial style are often huge floor lamps what turns them into real highlight pieces and you don’t need to add much more decoration to have the industrial effect. If you are searching for an industrial floor lamp you have a lot of choices. To make it easier for you, we want to show you our favourites. A real classic of industrial style is DelightFULLs Diana Floor lamp. This huge floor lamp is very impressive and can give any room the industrial atmosphere, no matter which color you choose. 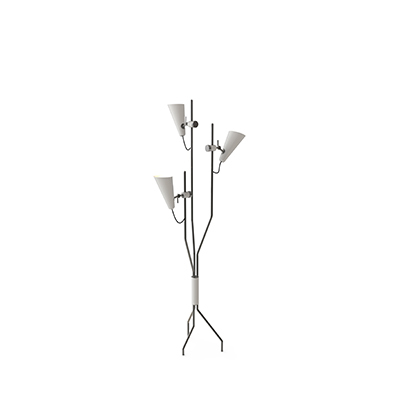 Or do you prefer a floor lamp that spreads the industrial flair in a more elegant way? Then Coltrane Floor lamp can be the perfect choice for you. The black finishing makes it a rough and edgy piece. We hope you liked our ideas and we could infect you with our love of industrial style. Do you prefer another style of interior design and want to know more about it? Let us know and leave a comment! You can find more inspiration in the other articles of modern floor lamps.